From Release: THE TROGGS first entered the Australian charts in 1966 with “Wild Thing” going all the way to #1 knocking Frank Sinatra off the top spot! Their follow-up single “With A Girl Like You” was also a top 10 smash going to #8. Their Aussie chart success continued with their third single “I Can’t Control Myself” (later covered by our own James Baker) reaching #13 and solidifying their place as one of the most successful British bands to come from the wave of 60’s bands. They hit the charts again with “Love is all Around” which was covered by Wet Wet Wet in 1994 and spent 6 weeks at #1 in Australia (15! Weeks at #1 in the UK)… Reg Presley famously spent some of his song-writing royalties on crop circle research. THE TROGGS toured the world to sell-out audiences and were everyone’s favourite Brit-rock band. This will be an evening packed full of your favourite hits by THE TROGGS. Expect to be taken back to your teenage years in what could be your last chance to see one of the world’s most legendary rock bands live. And we guarantee you, everything will most certainly be groovy…. 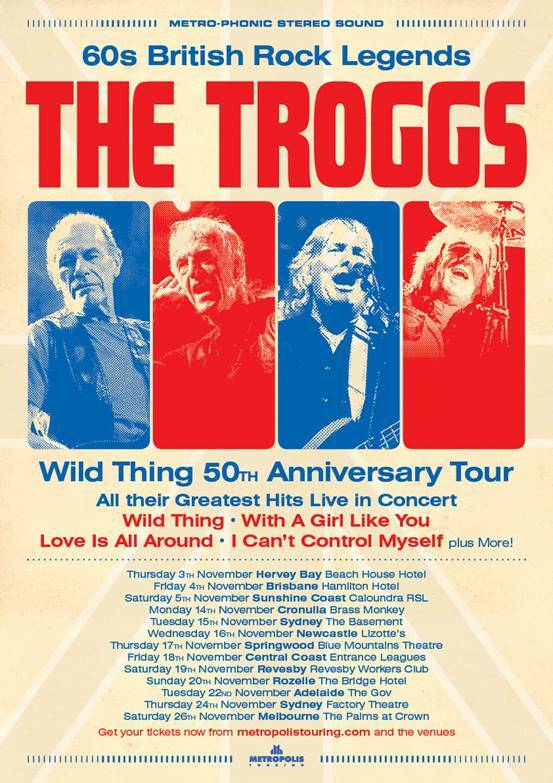 Come and get wild with THE TROGGS! A 50th Anniversary tour… man, how does that make you feel that you’ve been doing it this long and are still out there touring the world? It’s weird because it feels like it was all really yesterday *laughs* it’s very strange it’s like time travelling. What are your crowds like these days, with such a career and iconic songs have you witnessed a varied age bracket at your shows? The crowds vary actually, we get a pretty good cross section, the young ones come out of curiosity I suppose and a few our age turn up if they’re as still as mobile as we are that is *laughs*. Yeah, we get a good cross section , we’ve just come back from a couple of gigs in Europe, one in Germany and one in Belgium and they were huge, enormous gigs but there quite a few bands on, but we like to keep it all going. It’s been a while since you’ve been to Australia, so can you give us an idea of what people can expect from a Troggs show in 2016? 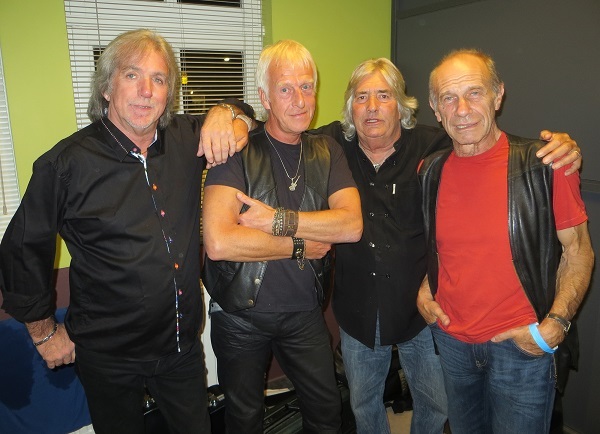 Well, a Troggs show in 2016, pretty much *laughs* apart from the fact we look a bit older, not really a lot different from the last time we were over I suppose, we do mostly the songs that people want to hear, the hits, a few of the B-sides and album tracks, everything we play is stuff we’ve recorded ourselves or written ourselves. So you definitely got a Troggs show you don’t get us playing other people’s stuff. What are you looking forward to doing on this trip Australia other than the shows? Last time I remember being in Newcastle, I think we’re playing there… I’ve got a list of where we’re going and traced it all out on a map, it’ll be an interesting tour because we get to see quite a bit of Australia this time as well as end up on a boat. I think we’re allowed the liberty of a couple of days off *laughs* we’ll probably stay in bed. We’re going over to New Zealand on this run too, seems a shame to go all that way and not have a good look, it’s a heck of a journey to get there. Of course I need to talk to you about ‘Wild Thing’ a song that was topping the charts ten years before I was born. Did you ever think when recording a cover that had something that could take off the way it did and would still be loved so many years later? It’s pure luck we were in the right place at the right time and the song came in our direction and we decided to have a go at it and we did it our way and luckily it was the way that took off and people liked. It’s a bit like winning the football pools or lottery and I believe we won with that one. It’s weird it does seem to connect with every generation that comes through and it’s very, very simple lyrics, easy to play, anybody can play it and it’s probably one of the first songs that people learn to play on their own on the guitar. How does it feel to have a song with such a legacy behind it where it’s been covered and in movies and is always referred back to you guys? Again it’s one of those songs that most rock bands wish they had the opportunity to record first time around , pure luck that we were the ones that came across it at the right time. It’s kind of funny that your most recognised song is a cover and then Wet Wet Wet covered one of yours and it’s their most recognised song. What did you think of their cover of ‘Love Is All Around’? I thought it was brilliant, they did a good job of that. Their version of was a bit more musical than ours, but we’re not particularly famous for being musical, our gigs are more like a sporting event. Now it’s been twenty four years since your last studio album, has there ever been any thought of a new album or new material? No I don’t think so, it would be a bit self-indulgent if we did, I don’t think there’s a market out there that would be particularly interested in new stuff from us, and there’s so much new stuff from young people coming out it would just get lost in the pile. It would probably be a bit of a wasted effort really. What is it that you still enjoy about being part of The Troggs and playing these songs after so long? It’s fun to go out and play the songs, the enjoyment is getting the audience reaction, that’s what the buzz is, and everywhere is different. I enjoy travelling around and seeing different parts of the world and it gives us the opportunity to do that. The say to see the world join the army or the navy, but it’s even better when you join a rock band because you don’t have to fight. It’s a great way of seeing the world and we actually enjoy playing to a new audience because we get a buzz back from the audience. So there’s always that bit of feedback. Adrenaline is a wonderful drug, it’s natural and it hits you every time something goes right. Well, we don’t know… next year I suppose. We’ll keep trundling on, we’ve got a few gigs for next year already and we’ll see what happens. When you’ve been doing it this long, how much longer do you think you’ll keep going? We’ll keep going as long as there’s enough people out there interested to see us that can still get about themselves *laughs* obviously if it becomes impossible or we start looking really silly well we’ll stop it. World’s wide open here… hopefully get some surprise good bookings for the year after.